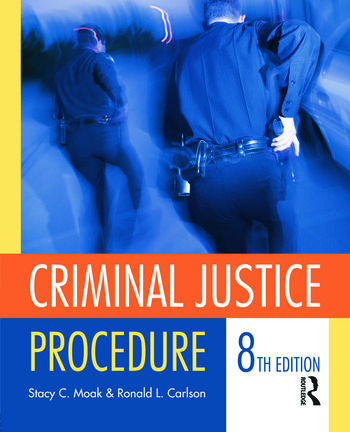 Criminal Justice Procedure gives clear guidance on the most common questions faced by today's law enforcement, offering fresh look at 21st century pre-trial protocol. Unlike other case books, this newly revised edition eschews legal theory in favor of the practical know-how needed to not to parse, but apply criminal law. Emphasis has been placed on just exactly how practitioners should conduct hot-button procedures such as airport and border searches. Moreover, the book also addresses the often dire implications of deviating from proper practice - how a false step can translate into a violation of individual rights, or the inability to successfully prosecute the guilty. This edition has been specifically designed for CJ undergraduate programs (rather than higher-level law schools) and completely reorganized for a more logical flow of topics. Moreover, it is newly focused on the most crucial practical applications of the law in the CJ context. There is also added emphasis on the Fourth, Fifth, and Sixth Amendments. Stacy Moak is currently teaching in the Criminal Justice Department at Troy University. She was formerly at the University of Arkansas at Little Rock, where she served as Graduate Programs Coordinator as well as director of the Juvenile Justice Center, which she founded in 2006. Moak is a member of the Academy of Criminal justice Sciences (ACJS) and has served the Academy in many positions. She is also a member of the American Society of Criminology (ASC) and the Environmental Crime and Criminal Justice Association (ECCA). Additionally, Moak was on the editorial board for Youth Violence and Juvenile Justice for eight years, and is presently on the editorial board of The American Journal of Criminal Justice. Moak teaches many classes relevant to law and criminal justice including Juvenile Law and Process and Criminal Law. She has published, and conducts research, on various legal aspects of criminal and juvenile justice. Moak earned a Ph.D. in Urban Studies from the University of New Orleans and a J.D. from Loyola School of Law. Ronald L. Carlson is Fuller E. Callaway Chair of Law Emeritus at University of Georgia Law, where he has been on the faculty since 1984. A prolific scholar, Carlson began writing about and analyzing evidentiary rules during the early stages of the Federal Rules of Evidence. He is the author of 16 books on evidence, trial practice, and criminal procedure. Carlson earned his bachelor's degree from Augustana College, his law degree from Northwestern University, and his Master of Laws from Georgetown University. He worked as a lawyer and U.S. Commissioner prior to joining the University of Iowa law faculty. He taught at Iowa for eight years then joined the law faculty at Washington University in St. Louis, Missouri, before coming to the University of Georgia.